January, January, January. Where did you go? I guess you disappeared somewhere between planning and rehearsing for a benefit concert, chasing a five year old and planning for our May arrival. I think it was a good mix of books this month - fiction and non-fiction and books I loved and books that were disappointments. Great picture! How are the music lessons going? ;) I so enjoyed Wild, glad to see if was your fave book of the month! Glad he enjoyed books! 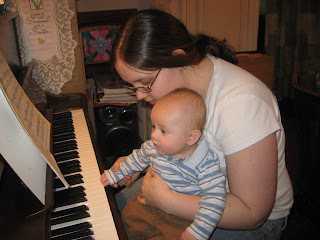 Maybe the piano will come as he gets older.